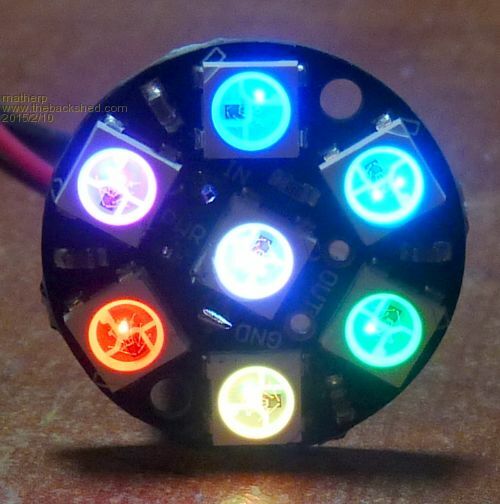 This code is a bit of example code for WS2812 RGB LEDs. I was able to properly test the code for sending out the pulse sequences. The attached code contains a simple example that fades in and out the colours and rotates them around the ring – I wish I had some artistic flair but that will have to do as an example! The code should be able to handle any number of WS2812 LEDs in the string – power supply and cost will be the limiting factors. The Cfunction code is included as comments. The WS2812.init routine sets the CPU speed to 48, the Cfunction will only operate correctly at this speed.